This is a blog about William Hogarth – an artist with no Bath connection other than his depicting the dire consequences of gambling and ‘whoring’ in his moralistic series of artworks known as The Rake’s Progress. He has a much bigger connection with Bristol in the form of three rather large canvasses that were produced as part of his efforts to be known as a history painter. I repeat a blog, published elsewhere a couple of months ago, as an aside for the Virtual Museum of Bath. There is no denying the fact that the National Lottery has helped make gambling respectable. All those pound coins cast by millions of dreamers into the great Fountain of Eternal Hope with the consolation that, if you don’t win a fortune, at least some worthwhile charity or focus-of-need will benefit from that myriad of ‘little somethings’ and get a cut of the proceeds! In Bristol lottery funds cushioned a fair wack of the £27 million it cost to give the old Industrial Museum ( and former 1950’s quay-side warehouse) a very expensive make-over. Money well spent, says the City Council, who point out that, less than a year after the new M Shed opened, it’s already welcomed nearly three quarters of a million visitors. This of course is latest the attraction to adorn their watery residential ‘pleasure park’ and one which tells the story of the city and its people in a fun and strikingly visual way. Finding novel and compelling ways of experiencing the past in the present is big business at the moment as, increasingly, Western Society finds it difficult to get excited about a fraught and uncertain future. Bristol can pride itself on being rather good at re-inventing things – although sometimes very reluctantly. Further along the Floating Harbour – itself a major historical make-over from a once thriving but rather grimey city dock – the award-laden ss Great Britain rests on both its blocks and laurels. When it was floated up the River Avon into Bristol – back in 1970 – it was a rusty old hulk the City Fathers were convinced would sink and block this vital artery to the sea. Her return was thanks to a few brave souls with enough foresight to see that this Isambard Kingdom Brunel designed and Bristol-built, ocean-going, propellor-driven, iron-clad steamer would one day justify the expense of the longest marine tow in history. Back across the ocean from its graveyard in the remote waters of the Falkland Islands. The ship could be said to have kick-started the steady transformation of what had been a watery slum. After years of turning our backs on the deserted coal wharves and timber yards we embraced the new-found joys of waterside living and socialising. M-Shed is also the latest in a cluster of satellite museums scattered around the city. And a big financial gamble in these times of frugality and irate council tax payers, maybe more concerned about essentials like housing, education and public transport.There is already a well-established City Museum and Art Gallery. The place – two summers ago – that witnessed amazing queues as people waited for up to six hours to view the exhibition by local-born, graffiti-artist Banksy. Add to that the Blaise Castle Folk Museum, the Red Lodge with its Tudor panelling, and the Georgian House. Up to ten years ago there was yet another ‘satellite’ in the Heritage portfolio. This time an Ecclesiastical Museum – created out of the Blitz-burned shell of St Nicholas Church. It closed in 1991 – a victim, even then, of council cuts. However, while the church plate, illuminated manuscripts and vestments were relatively easy to move elsewhere, one rather large piece of Bristol’s history is proving a major embarrassment, and a big obstacle, to disposing of the redundant church and – with the City maybe looking to make some savings – wfforts to recoup some money. He was , of course, the artist who came up with an original way of engaging with narrative art. The man who produced several series of paintings – reading like a morality comic strip – that often used humor and wit to illustrate the follies and vices of contemporary society. Hogarth’s prints and his portrait painting made his reputation and gave him a living. However this painter had ambitions in another direction, as a crusading Englishman who was determined to give his Continental artistic counterparts a run for their money. He wanted to make his name as a history painter and prove that he, and his countrymen, were just as talented when it came to working in the European ‘Grand Manner’. So when, in the summer of 1755, the Vestry of St Mary Redcliffe Parish Church in Bristol invited him to paint a large altar-piece for their church, he jumped at the chance. Though ‘history painting’ was regarded as the highest form of the art, there weren’t many opportunities in England for gaining commissions. Large-scale religious paintings weren’t a popular way of inspiring devotion in our more formal and Protestant-fuelled land. We had no ‘native’ school of history painting. In the mid 1730’s Hogarth decided to do his own ‘advertising’ and offered his services free of charge to the governors of St Bartholomew’s Hospital in London, in an effort to stop the job being awarded to an Italian painter. Hogarth produced two stunning religious murals, with figures seven feet high, on the walls of a staircase leading to the hospital’s Great Hall. Ten years later he organized a gift of four ‘home-produced’ history paintings to the Foundling Hospital, one of which he had created himself. But his exercise in self-promotion met with limited success. Apart from the Bristol altar-piece, he had only one more giant canvas to show in support of his argument that English painters could achieve the same qualities of intellectual dignity and greatness of style as those in France or Italy. In 1748 he painted St Paul before Felix for the Chapel of Lincoln’s Inn – though it proved to be too big and was hung in the Hall instead. The paintings for Bristol proved a little on the large size too when they were eventually hung above the altar of the medieval parish church of St Mary Redcliffe. Only the Ascension was visible from the nave – hung under crimson draperies and slightly higher than the two side panels – featuring The Three Marys at the Tomb and The Sealing of the Sepulcher – placed at right angles to it and facing each other. There Hogarth’s altarpiece stayed for a hundred years until changing tastes in architecture and a huge bill for urgent restoration work sent it off to wander around Bristol for 115 years. The Gothic Revival of the mid-Victorian age had no place for such Georgian baroque embellishments which many considered spoilt the appearance of so many medieval churches. In Bristol, St Mary’s wanted, amongst other things, to re-build its spire – demolished during a storm in the fifteenth century. It hoped the sale of the three giant canvasses might contribute towards the £40,000 they needed. Letters were exchanged with the National Gallery and Christies Auction Rooms ( founded in 1766 – two years after Hogarth’s death), and advertisements placed in The Times and in local newspapers, but without a buyer coming forward. Seems both the size of the canvasses and their subject matter was working against them. Despite the fact that Christies had sold Hogarth’s series of satirical paintings Marriage a la Mode in 1797 for 1,000 guineas. They now hang in the National Gallery. The man who finally helped find the unwanted altarpiece its first new home was Alderman Thomas Proctor – a local businessman and churchwarden who owned a fertilizer manufacturing plant near St Mary’s – and who now chaired the church restoration committee to which he donated two and a half thousand pounds of his own money. In 1858 he offered to buy the canvasses for a nominal £20 and present them to the Royal Academy for the Promotion of the Fine Arts to look after. A prestigious and private art establishment with at least one gallery wall big enough to take Hogarth’s giant canvasses. But this is not the end of our story. 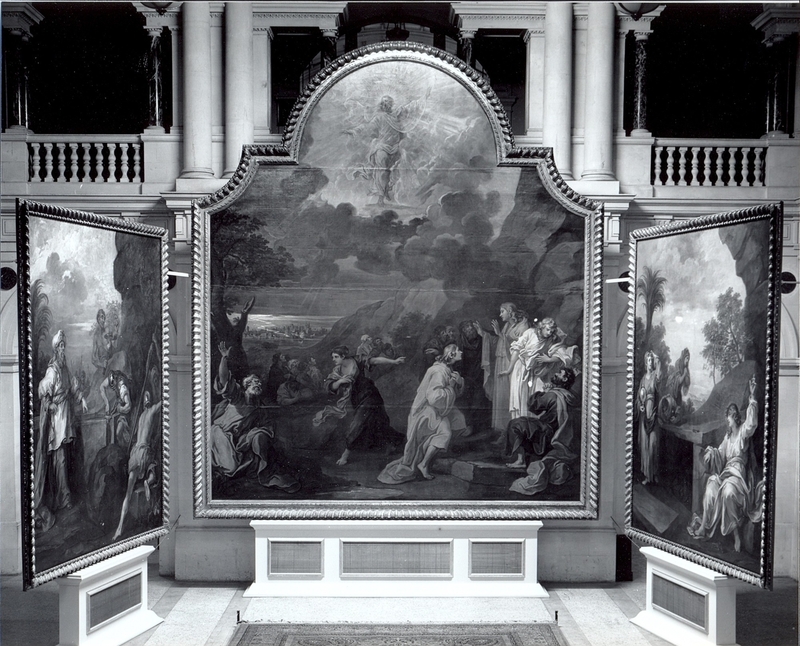 The Academy – now the RWA – tried to sell the altarpiece in 1910 to raise cash for new building work. The building was in need of restoration work and the Academy preferred its walls covered with more contemporary and home-grown art. The pictures were taken down, rolled up and put on show in London. Bristol’s local press lambasted the Academy for ‘preferring hard cash to art treasures’ and public opinion saved the day. For lack of display space and a refusal from St Mary’s to have them returned, the giant altar paintings went back into storage. The rolled canvasses spent their war in the basement of the City Art Gallery. There they lay forgotten – at least until 1953 when a former Sheriff of Bristol suggested the paintings be installed in the city’s impressive new Council House on College Green. You’ve guessed it already. They were just too big. By this time Hogarth’s artwork was being stored in a bonded tobacco warehouse. The biggest and most expensive ‘roll-up’ in the building. There had been post-war plans, meanwhile, to build a new museum and art gallery complex on space cleared by enemy bombs in the historic centre of the city and beside the River Avon. However, when rising costs brought an end to this proposal, the Council re-kindled its vague interest in using the old blitzed shell of St Nicholas Church, at one end of the proposed site, as a church museum. Once more the canvasses were taken down and sent for restoration. They were then erected at the east end of the newly converted building – a rather large reminder of the city’s more flamboyant ecclesiastical past. They are still there – looking down now on computer screens and filing cabinets. The museum has become office space for museum services.Very few people ring the door bell and ask to see them. For the trickle of callers, there is a viewing platform – so as not to disturb those now using the church floor as a workspace. It is my understanding the Council may be exploring ways of getting rid of this unwanted real estate. They cannot demolish the building – its listed – and the giant canvasses are a bit of a sticking point. I have privately asked a London art dealer to place a value on them. He was a student in Bristol and knows the work. Limited by its size and genre he said he could see it raising no more than a million pounds. Getting rid of the building may prove easier but who would want it with Hogarth’s canvasses still in situ? Some may ask whether the new harbourside museum should have found room for it and acknowledged its place in the city’s history? Who else has a wall big enough to hang it? St Mary Redcliffe does not want it back and nor does the RWA. Or maybe some people feel – with the opening of M Shed and the transfer to it of artifacts from elsewhere, it may have freed up space to put it back on display at the old City Museum at the top of Park Street. That, according to Julie Finch, the City’s Director of Museums, Galleries and Archives, is now exactly what they have in mind. It seems the Hogarth is now considered part of a wider plan for the redevelopment of the City Museum and Art Gallery and they intend keeping the paintings as part of the collection as they are ‘important to Bristol’. Whatever happens. Dismantling the canvasses and transporting and re-erecting them once more is going to cost a great deal of money. However, leaving them alone in a building that could be better used by someone else offers no long-term solution. I’d welcome some other views on the subject. After all – grand bank and insurance buildings in Corn Street have been transformed into bars and pizza houses with many original fittings still in situ. But if you feel that’s a better solution for this little ‘problem’ – just mind where you’re shaking that bottle of tomato sauce!